"WG.36 - 16c PENAL CROSS - (6.5 in.)" 16c PENAL CROSS: This 16c Penal Cross is unique to Irish fold art. the arms are short so it could easily be hidden up the sleeve. When England was trying to take over the land, they tried to destroy the hearts of the people by banning their language and religion. The answer to those who tried to practice either was death. So during these 'Penal' times, the church went underground. 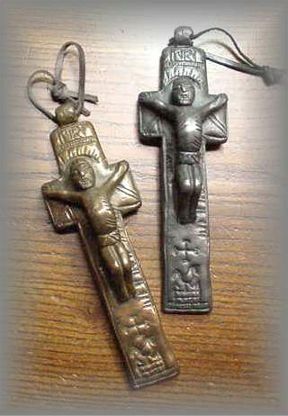 The rosary was prayed using this cross and often 10 beads for a decade. A ring at the other end was passed from finger to finger to complete the 5 decades of the rosary, 5 fingers, 5 decades.